Here’s a new way to cover a candidate debate online. 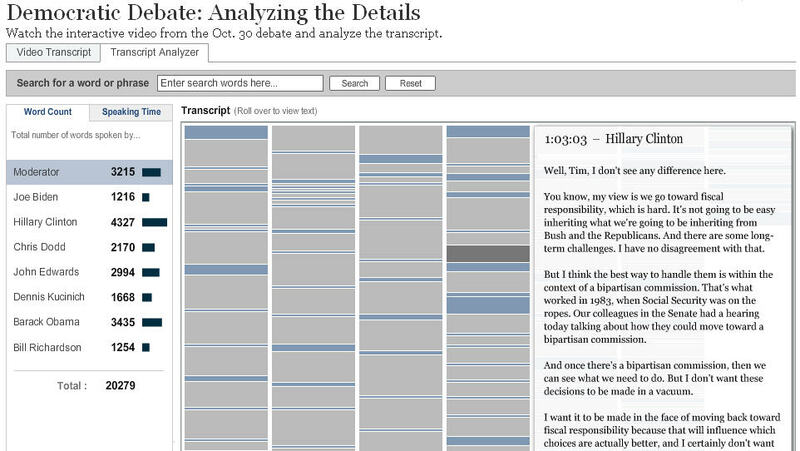 The New York Times created a very cool “transcript analyzer” for the 2007 presidential debates that let users see exactly who said what and when. You can type in a word or phrase and see how many times each candidate said it. If you click on a candidate’s name, the relevant comments are highlighted in the transcript. To read what the candidate said, you just roll your mouse over the highlights. Programming is a tool that we use as journalists. Just like there are journalists who are 3D modelers, infographic artists, audio specialists, photographers, videographers, writers, etc. It’s all journalism, it’s just a skill set we use to communicate. The Times also created a “video transcript” of the debate; when a user clicks on a topic, the streaming video jumps to that segment of the debate. Both features fit the definition of useful and fun, as well as interactive.